River rafting is one of the most organized and developed water sports in the India. It is one of the amazing sports with thrills. River rafting is starts from Rishikesh and another place shivpuri in River Ganges. The rafts are provided by many companies in the Rishikesh, you can also take Ganga beach camps for surprising your holidays. Tourists are also provided with experts, guide of water rafting. The sport of water river rafting gets the glamor from the names of many rapids between the rivers but it is no way to be taken lightly. It can always give you more than just a sudden rush of adrenaline in your body. It is teaching you the power of your mind and the way to challenge the limits and how to handle them with your quality. It is teach you how a team is works together and importance of a team. And to top it is also teach you how to handle stress and pressure at your work. It is recharge your energies, instill new life in your body and mind. This area is also closely to Rajaji National park, so here you can also see the good variety of residents and amazing migratory birds that are comes in the river Ganga. So it is also good place for spending your holidays. Best Time to Visit: - The best time to river rafting is March to June and Sept to Nov.
By Roads: - Rishikesh is well connected to the roads transport from other cities. By Trains: - Rishikesh is well connected with the railways lines. By Air: - The Nearest Airport is Jolly Grant Dehradun, Distance from Rishikesh is 20 km. 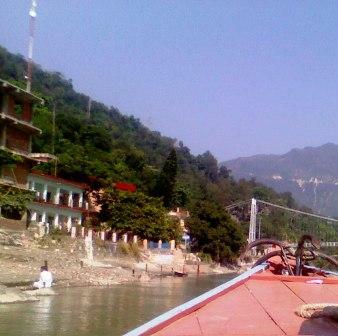 Rishikesh is famous for River Rafting. Thanks for providing us the vital information about the place for doing River Rafting .